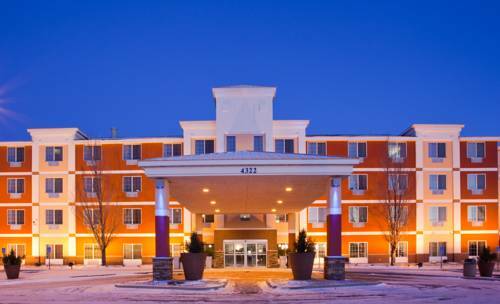 Conveniently located off I-94, the Holiday Inn Express hotel in St. Cloud, Minnesota is 5.6 miles from St. Cloud Regional Airport (STC) and offers easy access to the businesses and attractions of downtown St. Cloud. Whether you're here for a short business trip or an extended stay, you'll find both excellent service and amenities at this pet friendly hotel. The St. Cloud, MN area has a history in three major industries, granite, printing and lens manufacturing, and is home to Menasha Corporation, Dezuriks, the College of St. Benedict, St. John's University, St. Cloud State University and industrial parks, all of which are located a short drive away. Business amenities include a 24-hour business center, free high-speed Internet access and a meeting space with a helpful, professional meeting staff. In your spare time, you can visit the Minnesota Amateur Baseball Hall of Fame Museum, tour the peaceful Munsinger and Clemens gardens and other attractions near our hotel. St. Cloud, Minnesota is also home to the National Hockey Center, where you can see both the St. Cloud State and St. John's University hockey teams play. Our pet friendly hotel in St. Cloud, MN invites you to relax in your spare time in our two indoor pools and whirlpool. The fitness center is open 24 hours, so you can feel energized each morning before the complimentary, hot Express Start Breakfast Bar and unwind in the evenings. Casual and Fine Dining that serves lunch and dinner. They also have a full bar. Casual Bar and restuarant that serves American food. The park offers: Swimming, tennis, volleyball, horseshoes, an exercise trail, a disc golf course, ice skating facilites and cross-country ski trails. Two olympic size ice sheets with a main seating capacity of 6,000 for exciting WCHA action. The informal garden is 14 acres with winding flower bordered paths under tall pines. The Clemens is 7 acres of gardens. Free Admission. Is only open Spring through Fall. This golf facility also offers swimming, tennis and social functions. Member only club. 2 floors of exhibits and 4 miles of nature trails. Admission for adults is $5 and children are $2. Free parking. Take yourself out to the Minnesota Baseball Hall of Fame, where great memories in Minnesota Baseball are preserved. Largest undergraduate and master's level school in Minnesota, Accreditied and affordable. Plan your next meeting or show at the center of Minnesota, meet us downtown. The World's Largest Crow sits atop what is probably The World's Largest Branch. Push a button inside his gazebo, and the crow cries, "AAWWRRR! AWWWWR! Welcome to Crow Country!" ~42 miles from Saint Cloud. A 12-foot-tall statue of Bunyan, outside the local Welcome Center, made by a Minnesota artist. ~54 miles from Saint Cloud. Supersized replica of a colorful carved horse reminds Norse people of their blocky equine heritage. ~49 miles from Saint Cloud. Two big, nasty, toothy fiberglass fish, mounted on poles, with a platform for photo ops. The walleye appeared in 2006; it was such a success that the muskie soon followed. Well done. ~57 miles from Saint Cloud.